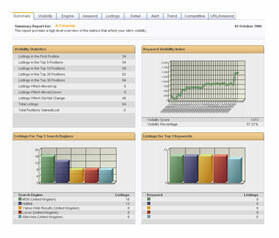 What does your Site visibility report show? A typical site visibility report consists of a variety of information depending on the amount of money that you have spent either with your SEO expert or the agency that you have hired for the enhancement of your web site. We will try to discuss the information based on the common industry practice with exceptions which may vary from agency to agency. This information is particularly useful for those who have just initiated the entry into the SEO phase. Moreover, it also makes sense for those who have been investing for their web site in this space for quite some time and further want to understand the nuances. Macroscopically, the site visibility report consists of the web site’s current position in the major search engines available in the online space. Generally, the common engines and the information pertaining to the ranking of the web site in each of these engines are provided. Additionally, some SEO experts also provide engine specific information for specialized engines or for those not-so-common engines. Based on these rankings, the web site owner might decide to focus on the betterment of the ranking of his/her site in one or more specific engines. This decision is generally left to the spender as it is a subjective choice most of the times and also depends largely on the perceptions and image of a particular engine in the web site owner’s mind. If we go in further detail, we can check the position of your web site on a number of different phrases or “Keywords”, as they are better known as. Depending on your service provider this number can vary from 10 phrases to 50 phrases and it mainly helps you to understand which of the phrases are important around which your web site should be more focused. This is also a very important parameter while deciding on pay per click amount that needs to be spent on each of the key terms or phrases. You might also consider introducing alternative phrases if the earlier terms that you had selected are not doing that great. At times, it might also happen that the web site of your competitors might be faring well on certain key phrases because their web pages might be more in tune with those key phrases. It also shows the number of your web pages which are indexed and thus helps you to understand the efficiency of your web team. Certain reports also provide the number of inbound links into your site and thus are an indicator of your overall online presence and the different places where your site is being actively and successfully advertised. Finally, you can also check on your competitors ranking and that would help you to understand how they are faring. This is very important, particularly when you are into a business of highly competitive nature. Thus, a site visibility report can also be termed as your business visibility report because more and more revenues in a business are getting driven by the online presence. Hence, it is a very important tool to ensure your success.